POLICE in Hereford have advised people against giving money to rough sleepers. Officers claim that a study this winter showed that all of those sleeping out in the city had been offered accommodation – and turned it down. Sergeant Duncan Reynolds, from Hereford City Northside Team, last month spoke to every person he could find who was living on the streets and also spoke to housing teams at Herefordshire Council. He said that “every single person saying they were homeless” had a house or flat being offered to them but turned it down. “Sixteen people I know were sleeping on the streets and not one of them was genuinely homeless,” he added. 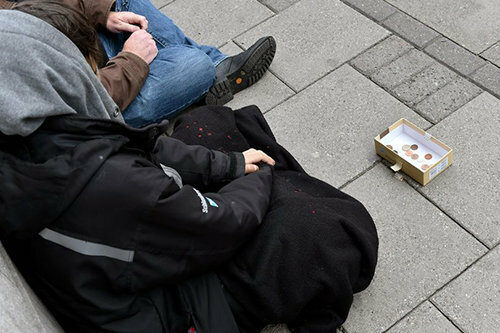 Sgt Reynolds said a homeless person in Hereford can earn £70 begging over six or seven hours. Police want members of the public to resist giving cash directly to people begging and to text a donation line instead, as they are concerned the cash is spent directly on drugs and alcohol. Vennture, a Christian cross-church initiative which has volunteers who aim to offer practical, direct support, has a text donation line that is supported by West Mercia Police. Officers believe these donations will go to a better cause – as opposed to the cash donations made to beggars which often, the police claim, soon find their way into the hands of drug dealers. He said: “Out of that group, a small number of them engage in antisocial behaviour. A CBO focuses on more serious offenders, who engage in criminal activity as well as antisocial behaviour. It often bans people from certain areas. The police say the high profile areas where antisocial behaviour occurs include the plinth near All Saints Church, Eign Gate and the Castle Pool Duck Pond. The areas outside St James’ Church, St Peter’s Church, St Peter’s Square and the Old Burial Ground in Commercial Road were also listed. The CBOs aim to protect the public, in particular businesses, which have to deal with antisocial behaviour. Sgt Reynolds acknowledges it is a difficult situation as the police are seen to be targeting vulnerable people, but he said there is help available at every turn, including help for drug addictions and alcohol dependency. He added: “We have got shelters open. Everyone is welcome in there. The churches, between them, offer hot food every day. There is no need to be homeless or hungry. “The one gap we do have is a day centre for homeless to go to to relax and stay warm. To donate to Vennture, text HERE03 £1, £3, £5 or £10 to 70070.